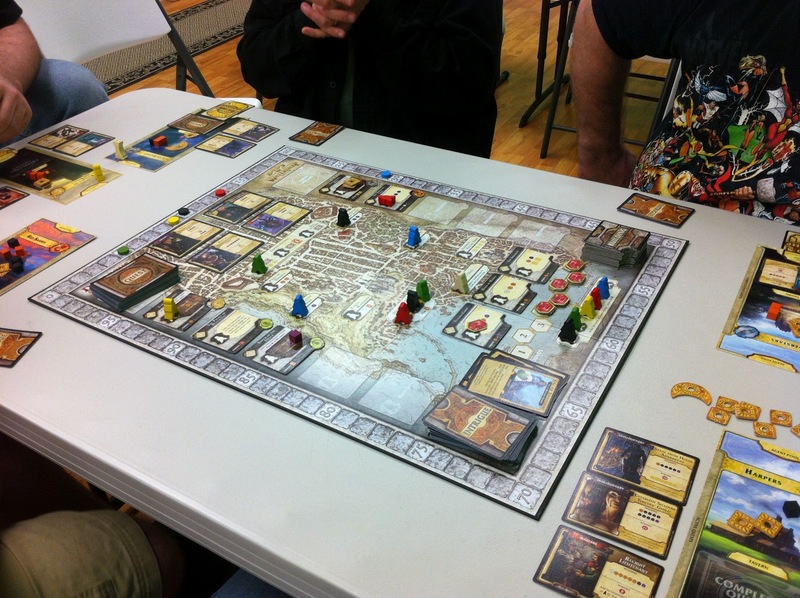 Set in the Dungeons & Dragons Forgotten Realms city of Waterdeep, players take on the role of lords controlling various political factions attempting to run the city. As a "Lord of Waterdeep" players dispatch their wooden 'Agent' meeples to various locations throughout Waterdeep which is represented on the game board. Each location has icons indicating what kinds of resources his agent will bring his lord from that area. Most locations either give money or adventurers. 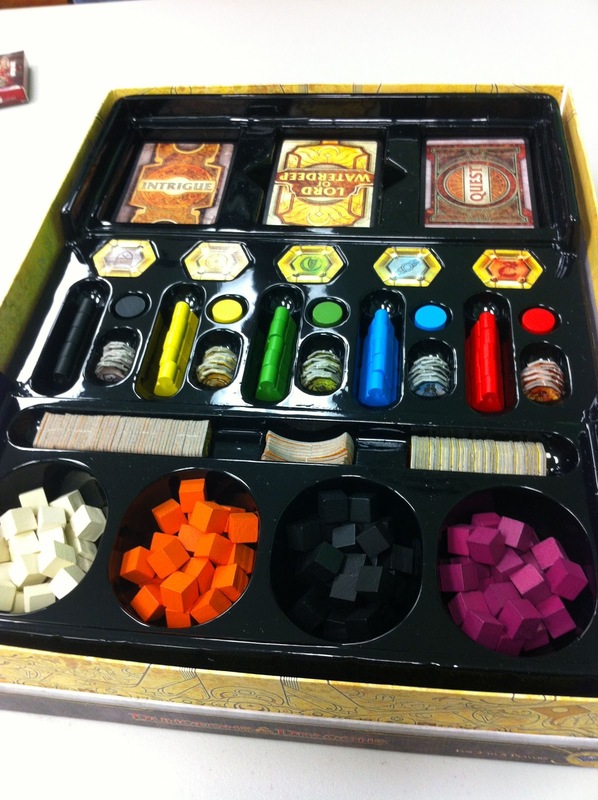 'Adventurers' are gathered and used to solve quests and take the form of different colored cubes: purple Wizards, black rogues, white clerics, and orange fighters. In addition to money and adventures, your agents can also gather quests in the form of quest cards. Players then 'spend' their adventures and sometimes money to solve a quest and gain victory points. The player with the most victory points at the end of turn eight wins. So far a fairly typical 'euro style' worker placement game, however there are two additional mechanics that set this game apart: Buildings and Intrigue cards. Buildings can be purchased by players simply by sending one of their agents to appropriate area on the board. Of course using an agent to buy a building means he's not out gathering resources from another location. When a building is bought it is placed on a board and the player who bought it snaps a special token into the corner to indicate he or she owns the building. This tile is now a new space on the board available for any player to send his agent to gain its unique benefits. The twist is that although anyone can use the new building, the building 'owner' gains a small benefit each time it is used. Thus the building tiles add both variety and a handy way to gain resources if you can convince someone to use it. While the buildings add depth and variety, it's the Intrigue cards which set this game apart by adding a level of 'american style' player interaction. Some locations on the board will allow players to draw Intrigue cards. These cards can be both helpful to the player, harmful to others, or both. Some cards allow the owner to gain 2 warriors, and one other player of his choice to also gain a warrior. Other cards might kill a cleric owned by each player. Still others are mandatory quests that can be played on an opponent which he must finish before working on any other quests he might own worth more victory points. To play an Intrigue card, the player must dispatch his agent to yet another special location on the board which then allows him to immediately play the card. We really enjoyed the Intrigue cards. They kept the player conversation lively throughout the game as we each begged for favors or threatened revenge. The mechanic also adds just enough randomness to keep things from becoming too predictable. 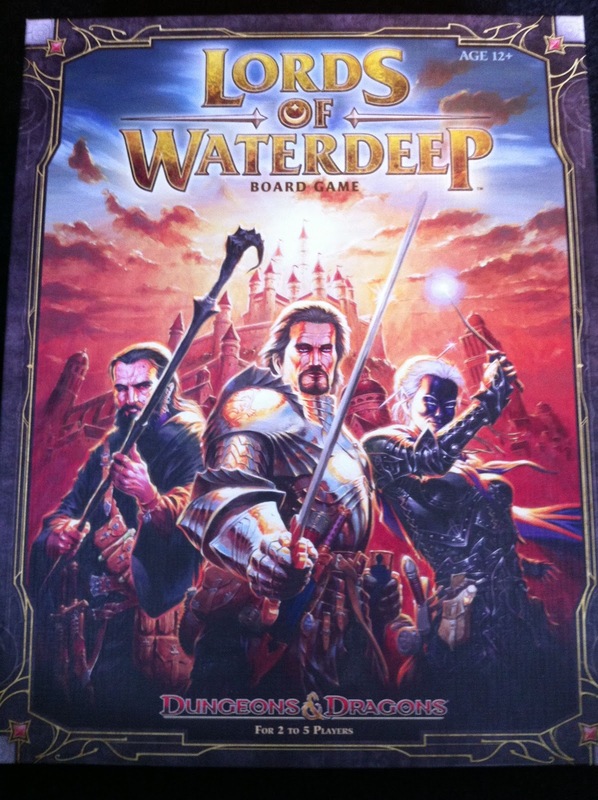 Lords of Waterdeep is that rare gem of a board game that gets nearly EVERYTHING right. From the moment you open the box you realize no corners were cut on this game despite its reasonable $50 price point. Days of Wonder, Mayfair, Fantasy Flight and the rest should take note: With this release Wizards of the Coast has proved they are the equal of any board game publisher on the planet. Having been a huge fan of The Forgotten Realms over the years (in particular the early ones) and played many D&D games in Waterdeep - I was on the fence about this game. I'm not a huge board game player. But you just sold me on this. Thanks for the overview. I played this game on Monday and was convinced after one play that it belonged in my collection. The rules are concise and well put together. It certainly appears that a great deal of effort was spent in making this game work. I had a great time playing it. It is sort of sad when Wizards, parent company of Avalon Hill, puts out a higher quality product that AH, which is supposed to specialize in this sort of thing!